Ok you have all heard me say drink lemon water in the morning, now I am going to let you in on my other little personal gem, Being Fit Inside and Out- With Cucumber Water. I have been drinking this for years, I learned about it after going to different spa destinations such as Vail Colorado, Paris France and Lake Placid New York to name a few, while they are far away from each other they all have one thing in common, after your treatment, they give you a refreshing glass of cucumber water to sip, relax and detox. So what’s so great about cucumber water? It adds a great fresh low calorie flavor to plain old water, and cucumbers are full of nutrients like vitamin C, K and A, iron, calcium and potassium. Cucumbers keep skin hydrated and healthy, they reduce inflammation in the body because they act as a diuretic by helping to reduce excess water and bloating. Cucumbers also help build bone strength with vitamin K so it is a bonus for menopausal women too. There are so many other benefits in addition to these. I recently purchased a really great glass decanter (pictured below) that is just the right size for my refrigerator, when I make my cucumber water I start with two to three ripe, juicy cucumbers that I slice on a cutting board that has little grooves along the edge to trap the juices that run off during cutting, I place the cucumbers and the juice in the decanter and fill it to the top with fresh chilled filtered water, I usually remove the skin and seeds but it is not necessary and a matter of preference. 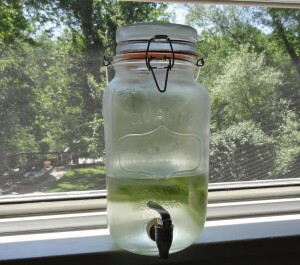 Depending on how much time that I have, I put the decanter in the window sill for an hour in the sun to really bring out the cucumber taste, but do not leave it for hours and let the mixture get warm and spoil. Just soaking the mixture over night is good enough to reap the nutritional benefits. My little extra treat: when the water is gone if I do not eat all of the delicious chilled slices, I will make an eye mask for puffy eyes or just a quick pick me up, you could be reaping extra benefits like younger looking, glowing skin because the vitamin C increases collagen and elastin production. 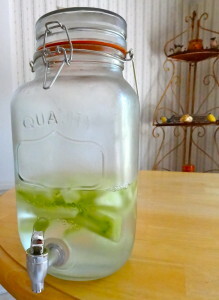 Start being fit inside and out with cucumber water, cheers to good health and glowing skin! Until next time GORGEOUS! This entry was posted in Beauty, Beverages and Smoothies.